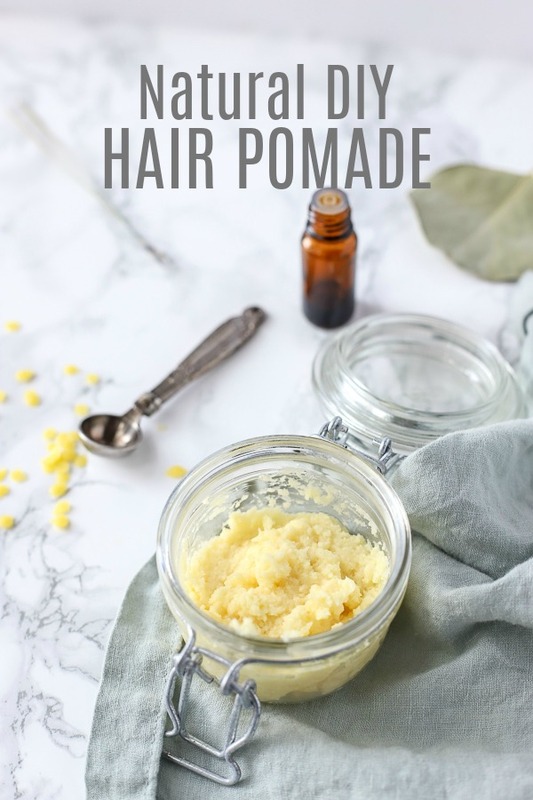 Natural DIY hair pomade with a few simple ingredients. Style your short hair with ease with this natural pomade recipe. Follow my tips below for making your own hair styling products. 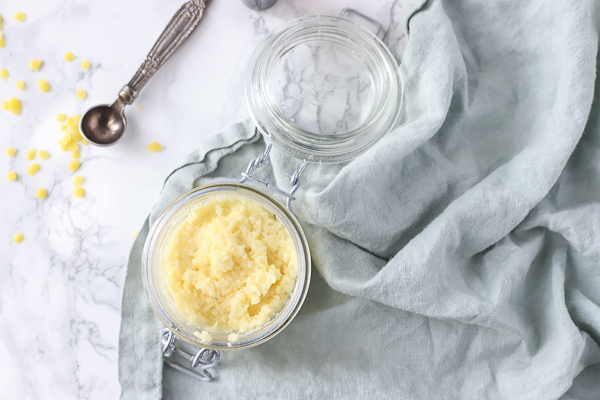 Ingredients you will need: beeswax, olive or avocado oil, and vegetable glycerin. I have been wanting to make this for the hubs for awhile now and couldn’t find the courage to do it! Well it finally happened and I am very happy with the results! Its pretty darn easy too! When we first started switching to natural products I would just switch out each of my old products as they were used up. Pomade is one my husband has had a difficult time replacing. He couldn’t find a good alternative to the conventional product he was using. The only one that he found he liked still contained petroleum based products and perfume. Two things we try to stay away from. Allow the ingredients to completely cool. Blend before it totally solidifies. Use beeswax pellets to make this recipe even faster or just grate beeswax with a cheese grater. Add essential oils if you want a pretty smell. But that is totally optional. In a double boiler or microwave slowly heat wax and oil together until melted, mix well. Add in vegetable glycerin and stir stir stir. Pop in the freezer for like 2-5 minutes. You don’t want it to be frozen, just to harden just enough. Add cornstarch and essential oils and mix it really well. You can scoop the mixture into a food processor essential oils (optional) and blend. Or use a whisk. Place in a container with a lid. It may start to separate a bit, just mix it up again and you’re on your way. Use on short hair to sculpt and style! Place a small amount on your fingers and rub through your hair. Style the way you like it. It lasted my hubs all day and its all natural yay! Sometimes you may get a clump, try to smash it between your fingers or Just pick it out. No biggie! Want more DIY products? Check these out! DIY hair spray is made with two simple ingredients. This is my favorite DIY Face Toner. The Ultimate Deodorant for Sensitive Skin. 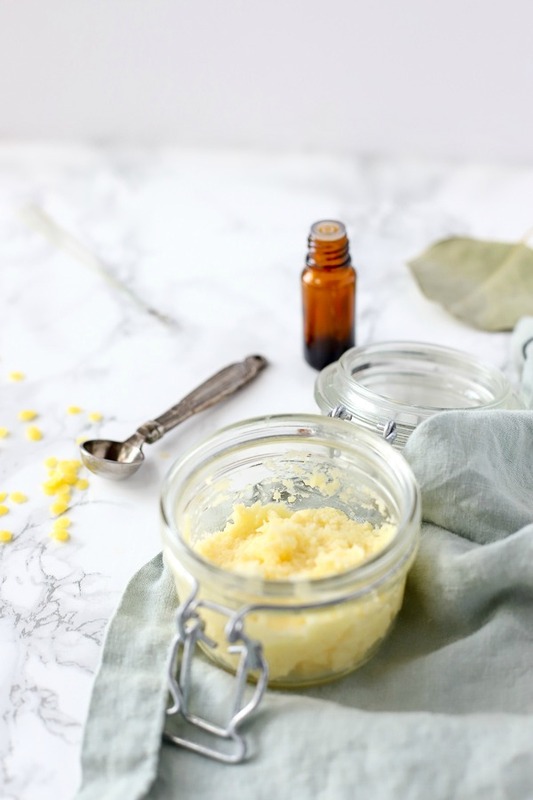 Which essential oils are good for hair and work well for pomade? Depending who you are making this for you may want to change the essential oils. For men: cedarwood and rosemary would work awesome. Lavender- can help increase the thickness of your hair by increasing the number of hair follicles (source). Cedarwood– can stimulate hair follicles and reduce dandruff. Peppermint – this study showed peppermint essential oil can significantly increase hair growth. Rosemary– can stimulate hair follicles and help grow longer, thicker hair and can help with premature baldness (source). Also helpful with dandruff. Do you think you can talk your husband or friend with very short hair to try this? I thought it would take a lot of persuading, luckily it didn’t! DIY hair pomade?! That is amazing!! I need to make some, seriously. I would love to try it out. Thank you! I love how excited you are about it! It makes me happy 🙂 Hope it works great for you! Does this make your hair hard? That is awesome and really funny about your blender. Ours bit the dust on Sunday…so I think we will be shopping for a new one soon. I have shoulder length hair and recently my stylist had me add hair oil (I use Argan) to my styling wax type stuff. It’s been doing what it needs to do for my fine hair. I will try this too. There are probably other uses for this…. I will be trying this as the ingredients in store bought hair gel reads like a periodic table! Thanks for sharing. Totally agree! My motto is if you can’t pronounce it probably shouldn’t buy it! Thanks for linking up to Whimsy Wednesday!!! Haha thanks Kelly! You crack me up! I just got done cutting my boys hair tonight, and my son wants to add some texture to his hair with wax, but I’m big on natural stuff around here, as in we even stopped using shampoo a couple years ago. So of course buying hair products is not going to work for mama, lol. I would love to give this a try, and if it works, woo hooo,,,, totally awesome!!! Thanks for sharing, and glad I stopped by. I am following you on Pinterest, and love your boards. Thanks! I hope this works great for you! Good luck getting healthy you’ll do great! This is a fantastic idea — thank you for sharing. 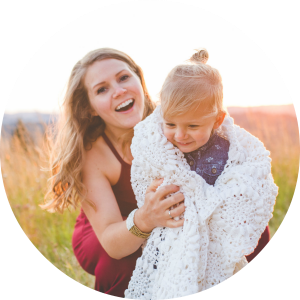 I’d love if you’d come join my How To Tuesday link party, too. I just went to try to join and it was closed :(! Maybe next time! It is a little but it just gives that little bit of shine! Its nothing overly greasy! I’ve tried hair pomade before and how awesome is it to make your own! Thank you for sharing, hope to see you tonight for another party! I am going to try this today, but also infuse the oil with rosemary which is said to help with hair growth. wow this is great! im always looking for natural products for my husband’s hair! cant wait to try this! Hi…I am just curious. Why the glycerin? What purpose does that serve? Well I thought just the oil and beeswax was to hard and a little to greasy. This give it the texture of pomade and helps the hair be more sculptable! More then likely cause she is a hair dresser & uses some of the top brands of Pomade Out their…..tho she does like most of my handmade goodies like soaps & whipped lotions & scrubs so ya never know in-till you try.Right?? I’m sorry if someone has already asked this question. Is it had to wash it out the pomade? It seems like the wax might be tought to remove. I was wondering about the ease of washing it out as well. I’m growing my hair out a bit (from a buzzcut) and would love to try this, if it doesn’t leave a build-up. Just curious, where do your beeswax and vegetable glycerin from? Your products look great, you’ve put a lot of heart into this. I’ve been searching endlessly for the right jar and yours looks really close. I want a 10ml glass jar with straight walls. Have you come across anyone who carries this kind of jar?